His latest piece will be unveiled as part of the re-dedication of the Remsberg Wing at the Federated Charities building in June. Ramona Remsberg was a friend and benefactor for many nonprofit organizations in Frederick before her death in 2004 and her efforts were instrumental in the capital campaign, renovation and expansion of Federated Charities in 2000. The re-dedication of the wing, named for her legacy highlights the mural and a small collection of local artists’ works as part of our organization’s Gold Frame Legacy project. The mural is made up of 3-6x2 foot panels arranged as a triptych and is a combination of paint and mosaic tiles. Its focal point depicts the iconic dog statue standing at the front portico of the Federated Charities building since the 1850's. It also features several recognizable Frederick elements, such as a Frederick key, the spires skyline and Baker Park. Mr. Owens has installed interior and exterior murals at a variety of locations, including the Housing Authority of the City of Frederick, Heartly House, The Boys and Girls Club. Each project brings together local artists to work on each piece as a collaborative effort. 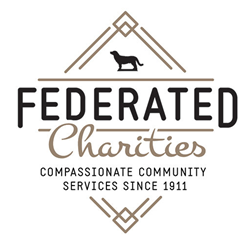 The mission of FEDERATED CHARITIES for more than 100 years has been to provide compassionate community services in Frederick and offer education and resources which support nonprofits in a collaborative environment so they can better serve their local clients. The German artist Gerhard Richter said, “Art is the highest form of hope,” and our 14 tenant-partners provide hope and services and opportunity to individuals and families in Frederick every day. Our organization is proud to put a roof over their heads and make sure they have the resources to continue to carry out their own missions. The re-dedication of the Remsberg Wing and mural unveiling will be held on Tuesday June 5 at 3:30pm at the Federated Charities Building (22 South Market Street, Frederick, MD 21701).